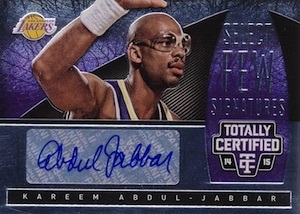 2014 Panini Totally Certified Basketball may have a new look, but the overall feel and focus still falls in line with its wild-looking history. 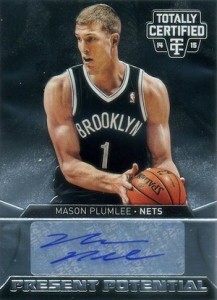 Offering a hit per pack, boxes have one autograph and three memorabilia cards. 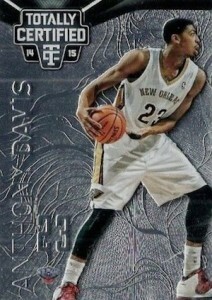 Every pack also has one parallel. 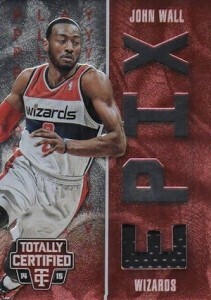 The 2014-15 Panini Totally Certified Basketball set has a total of 200 cards. This breaks down to 140 base cards, 40 rookies and 20 variation short prints that have an alternate photo from a player already featured in the set. 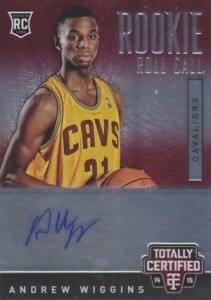 Rookie Roll Call Autographs feature on-card signatures from key first-year players. A total of 36 rookies signed for the insert set. Base versions are numbered to 299 or less while Mirror parallels are limited to 25. 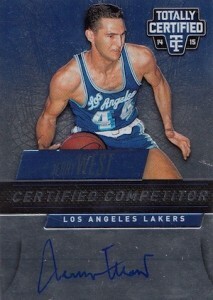 With a checklist of 100 cards, Totally Certified Signatures is the biggest autographed insert set in the product. All are numbered to 99 or less and have Mirror parallels (#/25). 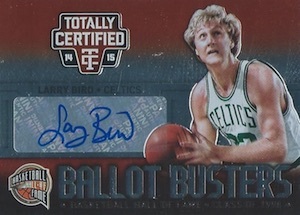 Other signed sets in 2014-15 Panini Totally Certified Basketball are Certified Competitor Autographs (60 cards, #/99 or less), Certified Select Few Signatures (40 cards, #/99 or less), Certified Future Stars Signatures (60 cards, #/99 or less), Certified Present Potential Signatures (60 cards, #/99 or less), and Certified Ballot Busters Signatures (40 cards, #/60 or less). Memorabilia cards fall under three main categories, each of which has its own assortment of parallels. 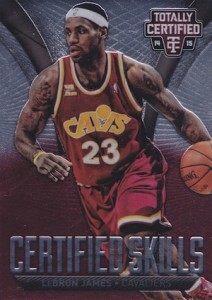 Totally Certified Jerseys has 100 different players. Red are the most common, numbered to 249 or less. Five levels of color-based parallels are numbered no higher than 199. EPIX does things a little differently. 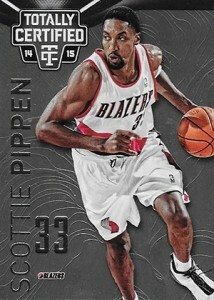 Each of the 25 players in the set has four different cards. Not only do they have different colors, rarity and number of swatches, but they each have a different photo as well. EPIX levels include Red Play (#/199), Blue Game (#/149), Gold Season Triple Memorabilia (#/10) and Green Moment Quad Memorabilia (#/5). 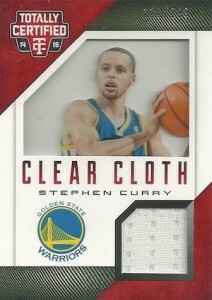 Clear Cloth (100 cards) uses acetate to display the play and give the card a bit of a different look and feel. Besides base Red versions (#/299 or less), there are four parallels numbered to 199 or less. 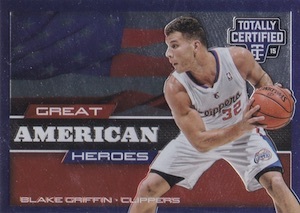 2014-15 Panini Totally Certified Basketball has a trio of basic insert sets as well: Certified Excellence (30 cards), Certified Skills (20 cards) and Great American Heroes (50 cards). All basic inserts are numbered to 299 and have Mirror parallels that are limited to 25 copies each. 20 cards. View a full guide to the variations here. 40 cards. Players with *** only have Mirror parallel autographs. The base/parallel cards look like a couple of slinkies got tangled up inside of a Tempest grid(video game)! This highly anticipated draft class means this and most of the other Panini releases will sell though so why bother making them look nice, right? Goofy looking base design and I like to see the jersey patch pieces in bigger open areas not inside thin letters that spell out a word. Any word on when checklist will be out? Product release date is tomorrow! The design seems like pretty ordinary compared to the previous ones. I really hate rainbow cards wherein no real value added prepositions being made. The auto selection seems weak and lots of unknown signers dump with this set. Good: Great American Heroes, should add next time for the Marvelous European Heroes in future expansion to present continuity. Bad: too many signers that needed to be reduced. Rainbow cards too many and hard to collect. Luke warm response for collectors. Overall: just average. Tough to pull a good one here unless you want to try one for the thrill seekers. Busted nine boxes and wondered, why I was so stupid. 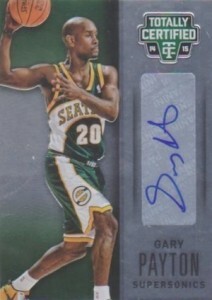 One patch card out of the break and only one auto that would sell for over $15.00 if I were selling. Very, very hit or miss and mostly a miss. 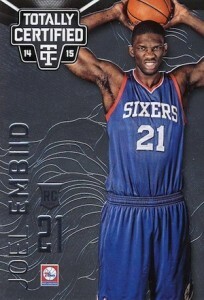 I should have known but kept thinking Panini basketball has to get better. Lesson learned, finally learned. Might be good value at 50% of what these boxes sell for, but not even sure of that. and the greater variety of them. 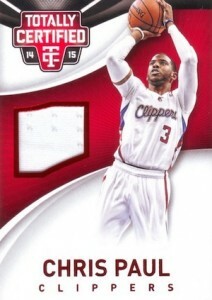 The ‘mirrored’ cards are essentially refractors. I would like to see Panini do multi-colored etching and expand from just the one color. 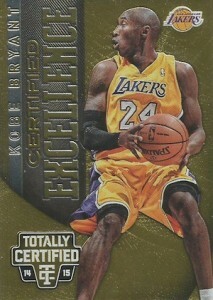 Great parallels much nicer design compared to previous Totally Certified cards. Love the look of the cards and the parallels are a nice feature but it was the Julius Randle auto that got me to order a second box which I was lucky enough to pull an Andrew Wiggins auto. I’m probably just lucky (based on other reviews) but I’ll definitely be ordering one or two 2015-16 Totally Certified boxes.